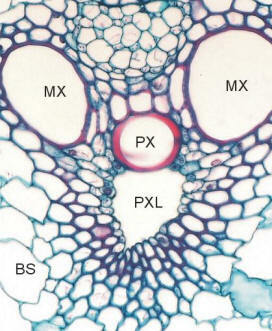 This micrograph shows a typical Zea mays vascular bundle in cross section. The phloem consists of angular, thin-walled sieve tubes, between which you can see small, almost square companion cells. You can see the xylem tissue below the phloem. It consists of two large-diameter metaxylem vessels (MX) which are separated from one another by smaller tracheids. A solitary early protoxylem vessel (PX) is all that is left of the first-formed xylem in this vascular bundle. Beneath this, is a large, irregularly shaped lacuna (PXL) - which represents the space previously occupied by the first protoxylem element to be formed in this vascular bundle. Beneath and surrounding the protoxylem lacuna, are mostly lignified, fibrous, thick-walled cells. The bundle is surrounded by a parenchymatous bundle sheath (BS). Question: How does the protoxylem lacuna come about? Explain what has happened here.